YES. YES. YES. It’s my favorite time of the year Philadelphia !!! It’s ‪#‎RADBQ season !!! Ahhhhh…..It’s time to experience the futuristic sounds of Making Time outdoors with the stars above, under the shade of towering plastic palm trees, with the raging waters of a faux rock waterfall descending upon your shoulders in a pool with a ‪#‎FISHBOWL in hand !!! 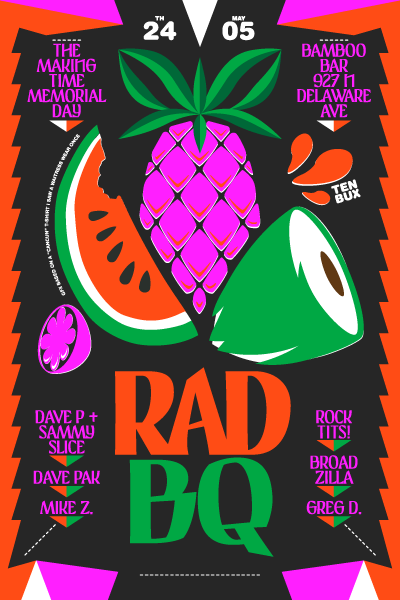 Oh yes….it’s time for the ‪#‎MakingTime Memorial Day RAD-B-Q on Sunday May 24th at Bamboo Bar !!! This entry was posted in Event and tagged bamboo bar, broadzilla djs, dave pak, davepandsammysliceunited, fishbowls, futuristicsounds, making time is rad, makingtime, makingtimeisrad, mike z, philadelphia, radbq, rocktits, sorted by admin. Bookmark the permalink.